It’s that time of the year again, folks. Thousands of people are trekking to San Diego to experience the biggest comic convention in the U.S. Companies roll out limited exclusives just for this show that almost always command a high price on the secondary market. This year there are some truly hot prospects. I’m going to go alphabetically and start with AFX or Action Figure Xpress. They have a few statues and Minimates, but two of their exclusives caught my eye. I mentioned earlier this year that Peavey was in attendance at Toy Fair, showing off their Marvel deco guitars featuring superheroes. AFX will have a limited Peavey Spider-Man Rockmaster guitar with artwork that hearkens back to the McFarlane days. Also of interest is the Masters of the Universe Power Sword letter opener. DKE Toys, which seems to produce a lot of art vinyl, has a special SDCC Slender Man that could appeal to Unwinnable’s very own Matt Marrone. 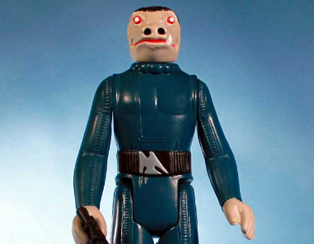 They also have a figure named “The Toy Whose Name We Cannot Speak” by Suckadelic, which resembles WCW wrestler the Shockmaster. It looks like a He-Man body with what appears to be a stormtrooper head cast in pink plastic. He is going for $150 and only nine are available. DKE will be releasing different figures every day, so be sure to stop by their booth. Entertainment Earth is one of the largest online toy and collectible distributors. They have quite a number of exclusives that can be ordered through their website should you not be in San Diego for the event. I’m digging the Six Million Dollar Man‘s Dr. Rudy Wells, which comes with a tin briefcase that is painted to look like Oscar Goldman’s exploding briefcase. 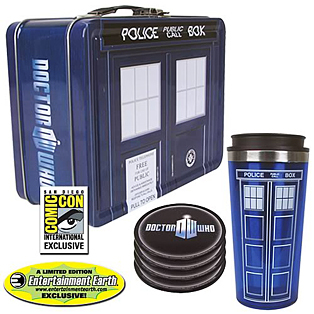 A favorite amongst Unwinnable and our friends has to be the Doctor Who TARDIS Tin Tote Gift Set, which will sell for $24.99. It’s a tin lunchbox with travel mug and coaster set. Every time traveler on the go is going to need one of these. Gentle Giant has some nice offerings as well, with a rad Mars Attacks! bust, McQuarrie Stormtrooper mini bust and a large-scale, vintage Kenner mold Blue Snaggletooth. Hasbro has some real showstoppers this time around and gets the nod from me for best exclusives of the show. First off is the Star Wars 7-Pack that comes in Kenner’s “lost” line packaging. The set is boxed in a carbonite chamber and features a carded Jar Jar Binks in carbonite that rises from its center. They also have the Derpy Hooves figure from My Little Pony, Hollywood Jem from the defunct Jem line and a zombie Cliffjumper and deluxe Bruticus combiner from Transformers. 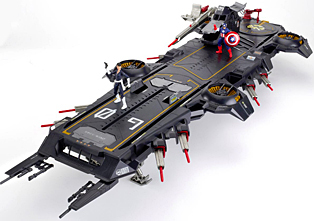 Representing The Avengers is the special edition 4′ Helicarrier. This piece looks pretty awesome, and I would have given this toy of the show had I not seen the next item. Hasbro is following up last year’s awesome G.I. 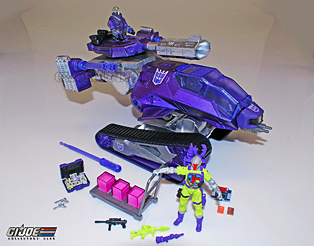 Joe exclusive with a Shockwave-Deco HISS Tank featuring a purple Destro, dayglo Bat, accessories and a mini Soundwave with cassettes. What an impressive set next to last year’s crossover. Mattel will have some Batman: The Dark Knight Rises figures, a He-Man exclusive and even a Hot Wheels K.I.T.T. Sideshow Collectibles has two members of the Bith Band from their Star Wars line, as well as Commander Fox. They are also releasing Lt. Falcon from their G.I. Joe line. While it’s not a groundbreaking character, I think it’s much better than last year’s reclothed ninja figure. Their standout has to be the Hot Toys’ Rescue Captain America, who dons his WWII outfit and has his original shield. Toys “R” Us will be in the house (available at the Entertainment Earth booth) with an Adventure Time Finn and Fiona set, all four 10 1/2″ Teenage Mutant Ninja Turtles (which will be sold individually for $30 or $100 as a set), My Little Pony Zecora and a Marvel Universe X-Factor box set. 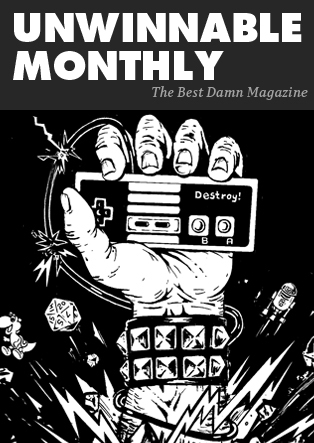 There are plenty more exclusives available. Check out the SDCC site for more information. What’s your favorite SDCC exclusive? Let the Toy Hunter know on Twitter @Kursse.